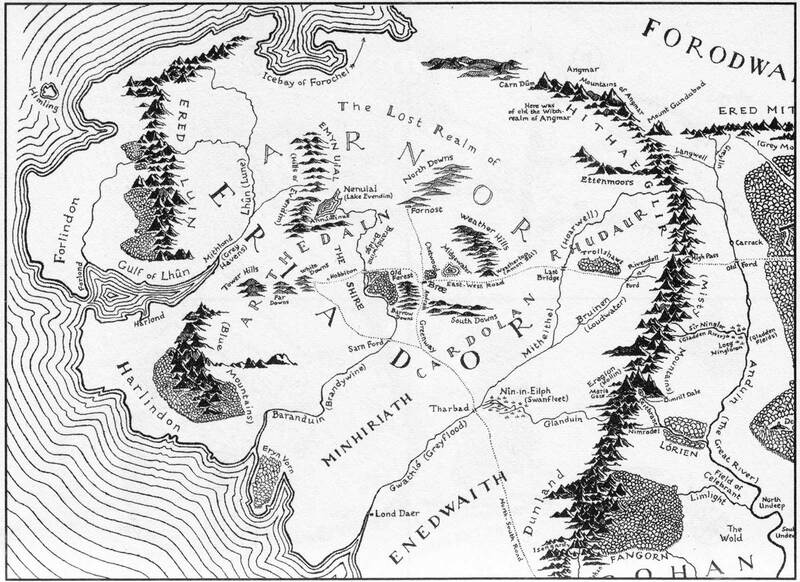 Your best go-to map of Eriador, made by Christopher Tolkien. This is your handy guide to the article ahead! Click for a high resolution version. I, for one, am incredibly excited about The Lost Realm expansion that is coming O so very soon for our game. The Rangers of the North are some of my favorites (okay, they’re all my favorite. But still…) and I love the land of Eriador. It is such an interesting region as it is a kind of dead place, standing in contrast to the more populated states of Gondor and Rohan, and even the region of Rhovanion. I am also very interested in the new idea of side quests and the role they will play with location control and getting us around the locales of the region. 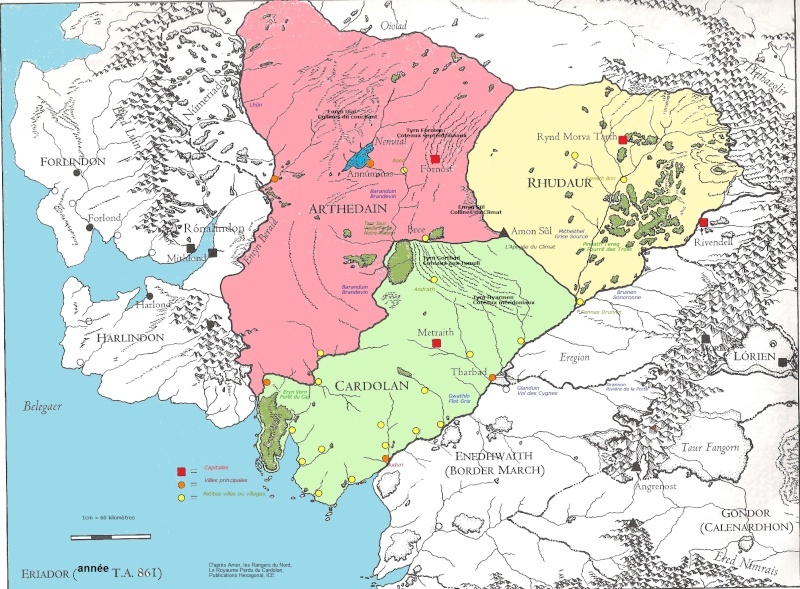 For my own contribution to the “Anticipating Angmar Awakened” series I am going to take you through the various subregions of the northwest of Middle-earth and share some of the locations that have already been spoiled, along with some of the sites we may see. 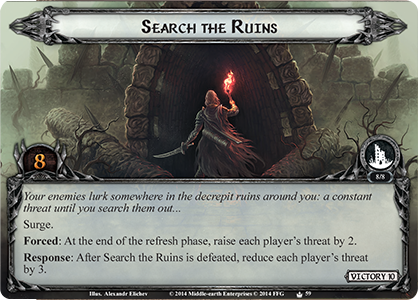 Search the Ruins is the first side quest we saw before this article. It is, seemingly, a generic card, aspecific to any quest, emphasizing the nigh post-apocalyptic status of the North. One such ruin is Fornost, or Deadmen’s Dike. Old Barliman’s quote here is, I think, quite indicative of the state of the world, or at least the North, during the time of the War of the Ring. What was once a proud land where kings ruled and brought law, justice, peace, and culture, is now a smattering of myths and legends that Men living just leagues away will not go and see for themselves. It’s also a fine indicator of the victory of the Enemy in his earlier machinations. Long had Sauron brewed his vengeance for the heirs of Númenor and his victory was almost complete against the northern kingdom: Arnor is, during the War, completely annihilated, reduced to bands of wandering rangers. As chance (such as it’s called) would have it, the remaining chieftains maintained their royal lineage from father to son and those efforts of destiny become manifest in the person of Aragorn, son of Arathorn. Read the full recalling of that storied history here. But Strider is heir to a broken kingdom whose time is not yet come. Left to him, and his kindred, is half a continent’s worth of ruins and memories. This is the region of Eriador, a geographical term for all lands between the Sea and the Misty Mountains from west to east, and from Forodwaith in the north to the Ered Nimrais in the south. It is also the name of the first Adventure Pack of this cycle: “The Wastes of Eriador”. It is Sindarin meaning ’empty land’ or ‘lonely land’ or simply ‘wilderness’. As expected from a philologist author, there is some nuance with the translation of the name which I will avoid here as it gets esoteric. What is intriguing, however, is that the name ‘Lone-lands’ has been adapted several times in several iterations of LOTR games (notably The Lord of the Rings Online) to refer specifically to that nameless track of land bisected by the Road between Weathertop and the Last Bridge, and contained by the North and South Downs. Specifically this is the area that The Hobbit actually calls the Lone-lands when Thorin & Co. pass eastwards of Bree. But when Strider and four hobbits go that way the name ‘Lone-lands’ is not used. In the excellent Rivendell supplement to The One Ring Roleplaying Game, which I used as a reference here in addition to the Atlas, Cubicle 7 have used ‘Lone-lands’ to refer to four different area not otherwise bearing a description in the book text or maps. Suffice it say that wherever they are, the Lone-lands are lonely! 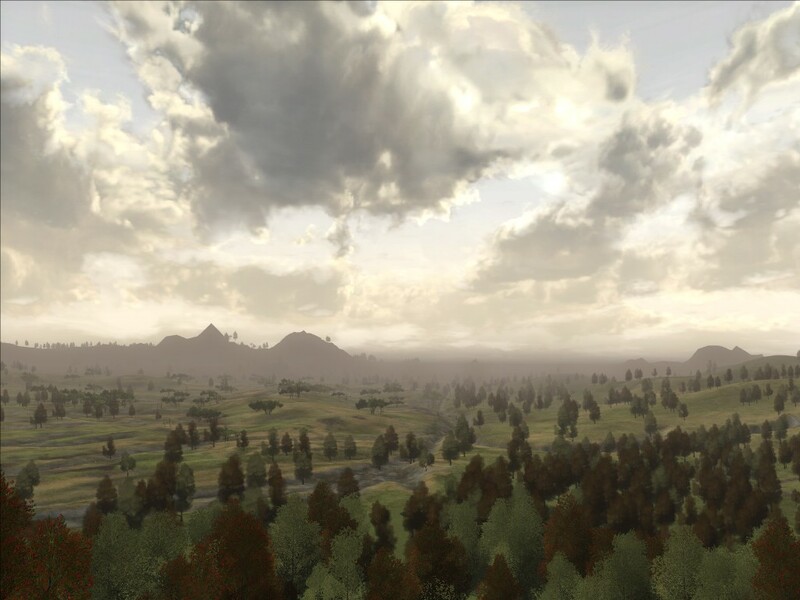 On a final note, on the maps of Eriador in The Lord of the Rings the phrase ‘The Lost Realm of Arnor’ is seen sweeping over the north of this wide land. 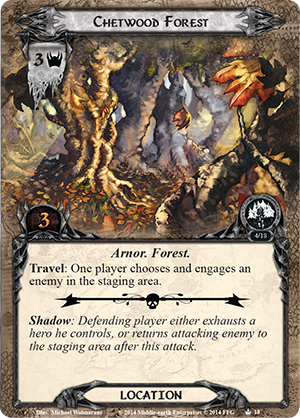 Besides serving as the titular reference for our upcoming deluxe expansion, it is also a note of who once ruled there. Arnor is the political name for the kingdom which, at its height, ruled nearly all of the diverse lands of Eriador to which we now turn. Let’s begin our survey in the east, near Rivendell and the Misty Mountains, and move westwards to the Sea. The Trollshaws are another one of those areas that’s exact location is a bit anomalous. The name roughly refers to the lands between the Last Bridge and the Bruinen, specifically the famous Fords, that stretch for some 30 leagues as the crow flies. 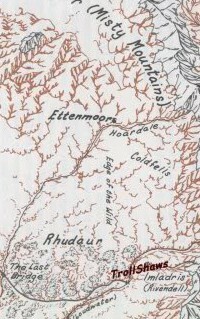 But there is some overlap with the area to its north, the Ettendales (or Ettenmoors), which we will come to next. As Gandalf says of his journey to Rivendell from Weathertop: ‘I reached here at last by a long hard road, up the Hoarwell and through the Ettenmoors, and down from the north’. Strider also says, as they traverse these woods: ‘We must find some way to turn back southwards again. If we keep on as we are going we shall get up into the Ettendales’. So the boundary is not entirely clear, nor is the map from the book perfectly helpful. However, as the term shaws refers to a wood or thicket it is probably safe to say that the Trollshaws are properly the steep, wooded hills north of the Road. Strider and the hobbits flee into these woods to throw the Black Riders off their trail, but run perilously close to becoming lost. The hills are sharp and craggy and no clear paths are there to lead the way. The ruins of Rhudaur haunt Pippin from atop the cliffs, further evidence of the sheer loneliness of the region. But this is also elf-country, being so close to Rivendell. Glorfindel rescues the weary travelers and the jingling of the bells of Asfaloth is an overwhelming comfort. Trolls came here from the north for the food and, perhaps, cover from the Sun. It appears this area was at least marginally inhabited for, as we learn in The Hobbit, three exceptionally smart trolls made victims of other folk in the region as evidenced by the remains found in their cave by Thorin & Co. One can imagine this place as fine quest-fodder, as no doubt Elrond and his elves would like to make sure this area stays as troll-free as possible. Another troll fight anyone? For a little more on the Trollshaws, see my previous article on the Trollshaw Scout. It’s already becoming a theme in this article: the geography of Eriador is a bit confusing. Before tackling the land of the ettens, let me make an aside and say that whether or not Tolkien intended this I think it is a lovely touch to the idea that Eriador is truly a lost realm (see what I did there?). While its inhabitants, like the Rangers, who know the land well surely understood its intricacies, for us the strict geography, both political and physical, is essentially lost. Elsewhere, like Gondor, the many different subregions are well documented in maintained. In the North, it is mostly rumor and oral traditions not easily recorded on maps. Therefore before dissecting the land we must, as with much of Tolkien’s stuff, dissect the names. First, Ettendale and Ettenmoor are meant as names in the Common Tongue so put your Elvish aside. As many of you (especially Brits) are aware, a moor is an upland or heath, high hills often referring to foothills of larger mountains. In this case the mountains are, naturally, the Misty. Dale is a dell, valley, lowland. Etten is an antiquated English word for troll or ogre and this is why the Ettenmoors are sometimes called the Troll-fells (fell being yet another word for upland). Proceeding northwards from the Trollshaws we would lose the woods behind us and enter into a rather flat, dreary place full of stones and waterways coming down from the Mountains. This is the Ettendales. While we never get a clear description in the book I cannot imagine this would be a happy place: it seems there would be few or no trees; being near the mountains it surely got a great deal of rainfall and must have been wet; and there were trolls everywhere. On a good day, I imagine wide lands of gray-green, not unlike the lowlands of Scotland or England that surely Tolkien must have had in mind. But it is a wasteland. The only folk that the trolls have not driven are Rangers and they do not tarry. Northwards still the lands would change and move upwards as we approach the Misty Mountains and, worse yet, Mount Gram. Crossing the River Hoarwell would put us in the Ettenmoors proper, as indicated on Tolkien’s map. I cannot imagine this being more than a ‘hillier’ version of the Ettendales. A wasteland full of trolls and goblins, the fear and darkness growing as we move closer to the dead lands of Angmar and the Witch-king. Also included in this region, though not specified, are the Coldfells where Aragorn’s grandfather Arador was slain by, yes, trolls. While it is never said in the text, both the Atlas and Rivendell put this snug in the angle between the spur of Mount Gram and the Misty Mountains proper at the source of the Hoarwell. Ms. Fonstad even makes the distinction that this area, just west of the Misty Mountains proper, should be included with Rhovanion in the greater territory called ‘The Wild’. 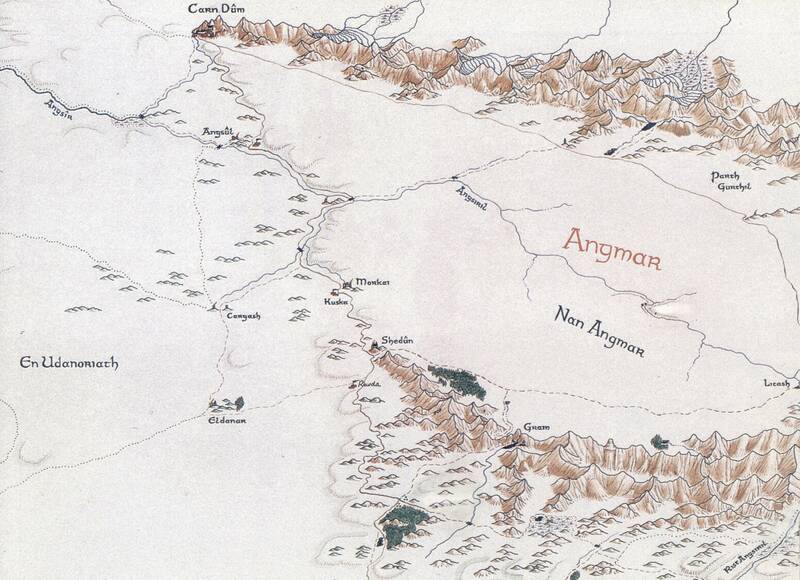 I would love to see this region explored in the game, perhaps in a task of uncovering some lost relic of the Rangers (or perhaps some other artifact of particular significance from Aragorn’s youth!). I also see these areas providing a lot of ‘generic’ locations. 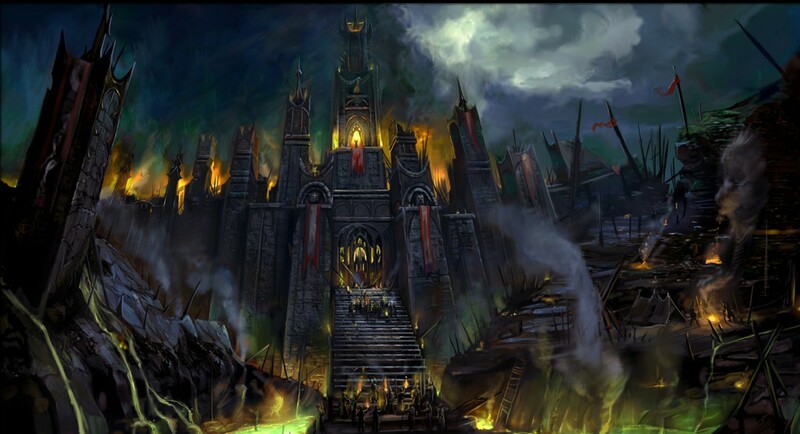 The Witch-realm of Angmar was a terror and a menace to the North for centuries. 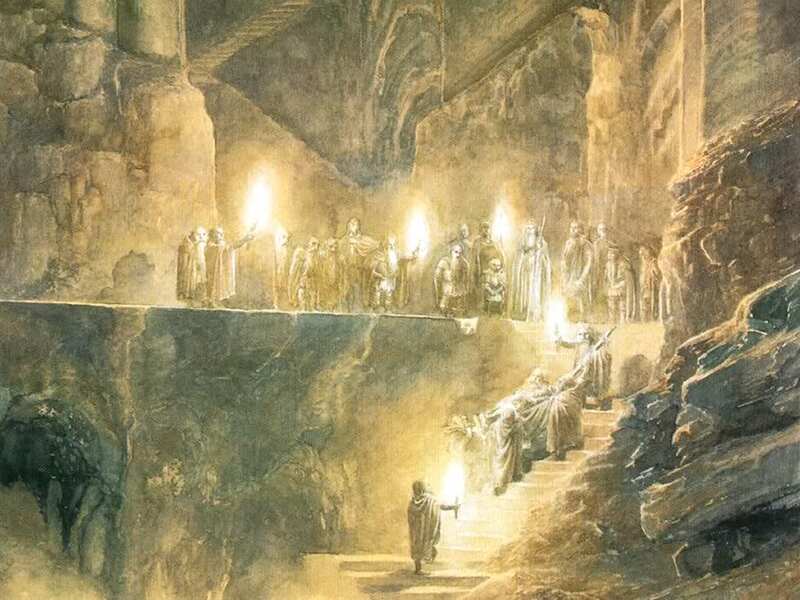 Beginning early in the Third Age, the Lord of the Nazgûl was sent (presumably) by his Master in Mordor to harass the descendants of Elendil in the North and weaken thoroughly weaken them as he attacked their sister-nation in Gondor. In 1975 a combined force of Gondorian knights, fighters from Arthedain, High Elves, and Hobbits struck a final blow against Angmar (the name also refers to the Witch-king himself) in which he and his forces were famously routed. Shortly thereafter the Wraith fled back to Mordor and his kingdom was no more. Again, Mike’s previous article has a full retelling of this history. Angmar has been popular fodder in many game adaptations of the stories as its history at the time of the War of the Ring is unwritten. In War in the North, The Lord of the Rings Online, Battle for Middle-earth II, MERP, and The One Ring RPG, bad things are returning to Angmar. In some cases entire armies are rallied under new rulers! It seems, based on the title of this cycle, that Angmar will be up to some nasty tricks again. How will Caleb and Matt and Co. pull it off with some originality? That remains to be seen! Will it mean massive armies rising against the remnants of Arnor? Small skirmishes in shadowsfar away from the simple lives of the men of Bree and the hobbits of the Shire? I do hope, however, that we will get to investigate Carn Dûm itself. Unless I’m mistaken we have not had a proper dungeon crawl (not counting Moria which, to me, is more like an underground city than a castle or dungeon) since the core set’s “Escape from Dol Guldur”! Maybe the wonderful art on the box, Matthew Stewart’s stellar rendition of Carn Dûm, is a clue. Whereas there has been some talk of greater variety in locations, meaning more helpful ones creating harder choices, I cannot imagine the land of Angmar being anything but hurtful. I can imagine the cold desolation, even perhaps bad weather signaling the return of evil to the far North, directly harming characters! Will it be similiar to “Redhorn Gate”, or something more subtle? Who can say? But expect nasty mountains and deep dungeons. I mention the far, far North now almost as a precaution. I don’t imagine we will see Forodwaith in this cycle. If anything it might be a stop in a single quest stage. Reason being, there just isn’t much there. There are snow-men, the Lossoth, who have a strange relationship to the rest of the world. There is, however, the potential for a beautiful landscape to be explore. Many have imagined the Lossoth as being based on the Sami people of Finland and northern Scandinavia is home to some breathtaking, and cold, sights! This realm was explored in-depth in The Lord of the Rings Online and that zone pulled no punches, going so far as to include its own version of the Northern Lights. There is, of course, the Ranger connection and the shipwreck of Arvedui Last-king. If discovery is going to prove a theme in this cycle, as it may, then a trip to the ice bay might be in order, though I doubt it. The Ice-bay of Forochel is home to the Lossoth and is frozen most of the year. To be clear, Forochel refers to the bay itself. Forodwaith refers to the northern waste (the name means simply ‘northern lands’), a frozen vicinity where practically nothing happens. Compare this to Enedwaith, ‘middle lands’, which is also sparsely inhabited, compounding the loneliness of Eriador. Some readers may have heard of downs, without understanding what they are (other than hills of some sort). Downs occur when layers of sedimentary rock dip away from hills or mountains and begin eroding back, peeling off layer after layer of rock. The more resistant rock layers sand up as long ridges, sometimes extending hundred of miles, while weaker sediments are eroded more quickly, forming lowlands…circular down ridges most often develop around a dome, such as the Wold and Downs near Fangorn…Eriador centered on the Weather Hills…so its assorted downs could have been eroding back from either the central hills, or the outlying mountains, or both. The watchtower of Amon Sûl was perhaps the most prized bit of real estate in the bloody history of the North. It is the highest hill of that small range of downs known as the Weather Hills, located smack dab in between the former kingdoms of Arthedain and Rhudaur. 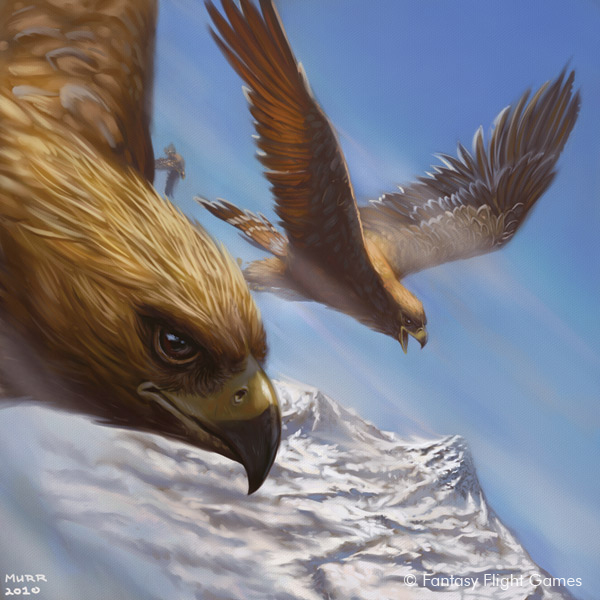 In fact the frontier was largely based around these hills because of their strategic value, most notably Weathertop’s. Just as downs are described above, that high hill have erosion lines and would have been crowned with a crumbling fortress on top. Not a part of the Weather Hills but a nearby range, the South Downs don’t get much attention compared to their sister range, the North Downs. They formed what was the majority of the kingdom of Cardolan, low hills ringed by erosion and tall grasses just like the Weather Hills and the North Downs. It was split by the great North-South Road and on the western side lay the hated Barrow-downs, the final outpost of Cardolan most accursed, run ragged by interfering spirits. Being a more or less blank page, I think the Weather Hills and the South Downs will be a worthy frame for any adventures we may find. Bordering all of this were the relatively calm lands of Bree. Bree refers to the hill (Bree-hill) and the town that sits on top of it. Bree-town was, of course, home to that most famousest of inns. But Bree is not complete without her sister villages, the little hamlets of Combe, Archet, and Staddle. Combe is another quite literal place name like Rivendell (“dell” is a valley and riven means to cleave or split, so Rivendell is a valley cloven into the mountains). 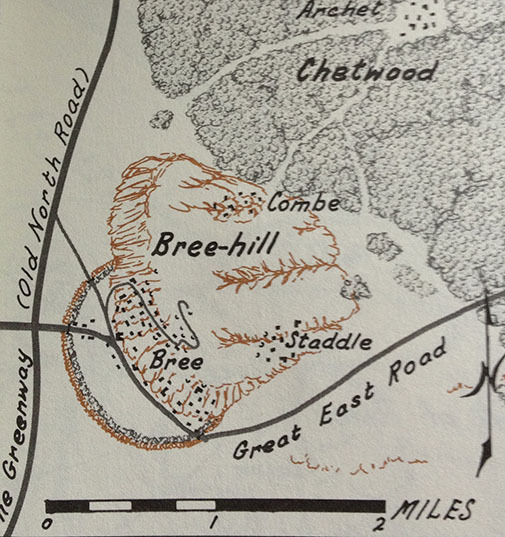 A “combe” is simply a steep valley, so the town of Combe would likely have been lodged at the bottom of Bree-hill in such a place. Staddle was likely inhabited largely by Bree-hobbits, and Archet was a small village edging along the Chetwood. We haven’t gotten many spoiled locations for this box yet but the two that we do have have come from the Bree-land. The first can barely be spotted under Strider in a spoiled card fan. The Borders of Bree-land forces us to return one engaged enemy to the staging area, presumably at the beginning of combat. The second spoiled location is simply Chetwood Forest, which also plays with engagement. 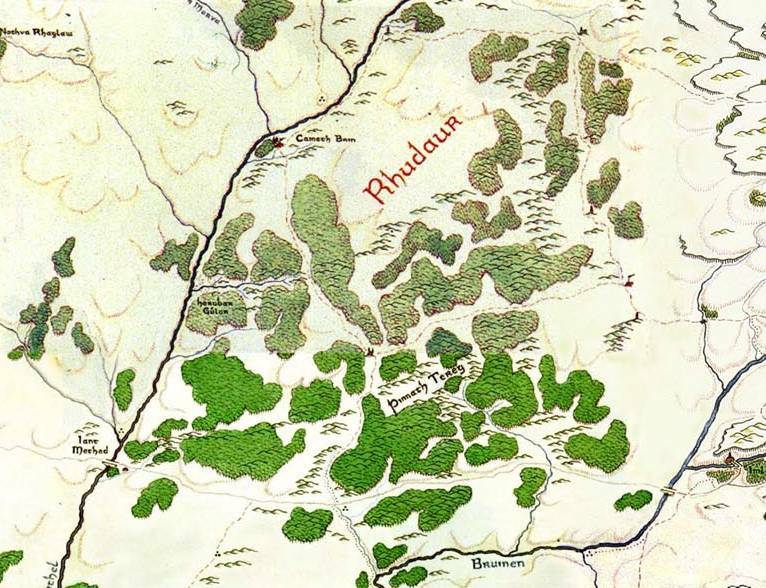 The Chetwood only gets a mention in the book; Strider takes the hobbits that way and then through the Midgewater Marshes to lose their Nazgûl pursuers. The root ‘chet’ is said to mean wood. The result is aesthetically pleasing, if literally redundant. We’ve seen the Chetwood mentioned once before in the game in “The Three Trials” pack. That adventure pack brought us Idraen and within the notes for that particular box came a short backstory on the Ranger, in which she pursues brigands into the Chetwood. Midgewater Marshes are also included in this part of Eriador. The marshes were a lowland between Bree-hill and the Weather Hills that filled with water from the little streams that came down from those hills. The result is a stagnant marsh full of biting little bugs called midges (or neekerbreekers). As Pippin says, ‘”Midgewater! There are more midges than water!’ Tolkien stated in a letter, and in his name guide, that the name Midgewater Marshes was a translation of Icelandic Mývatn. I should be curious to see how they adapt this to the game, if they choose to at all, as we’ve already had a few swampy settings: “The Dead Marshes” and, more recently, the “Nîn-In-Eilph”, which actually had Neekerbreekers. We’ve also had some marshy areas in a few of the Nightmare quests, with annoying flies to boot, and the actual location from the Black Riders box, so perhaps we won’t be revisiting the Midgewater. At the top I mentioned Fornost. This great fortress and the North Downs, the region of which they are a part, are repositories of the storied past of this realm. Here was once a thriving portion of the kingdom of Arnor and, later, its successor-kingdom Arthedain. Now the place is largely the home of roving orc-bands, brigands and thieves. The once majestic seat of Fornost is now called Deadmen’s Dike and remains a place of fear, though Rangers go there still. It is a lonesome place. But the Rangers go there, and to Lake Evendim, fighting to maintain the little that was spared them after the wars the Enemy forced upon them. It is a ceaseless battle as Orcs and worse rove here and there about Eriador, threatening the few free people who remain. Were it not for the Rangers, who would stop them? Just like the other hilly locales mentioned above, the North Downs is a range of hills and dells likely inspired by the uplands of Northern England. Green, lush, and vacant, there were surely once great farmlands to feed the realms of the North. I also like the thought that perhaps there are settlements of Dúnedain spread about here and there. 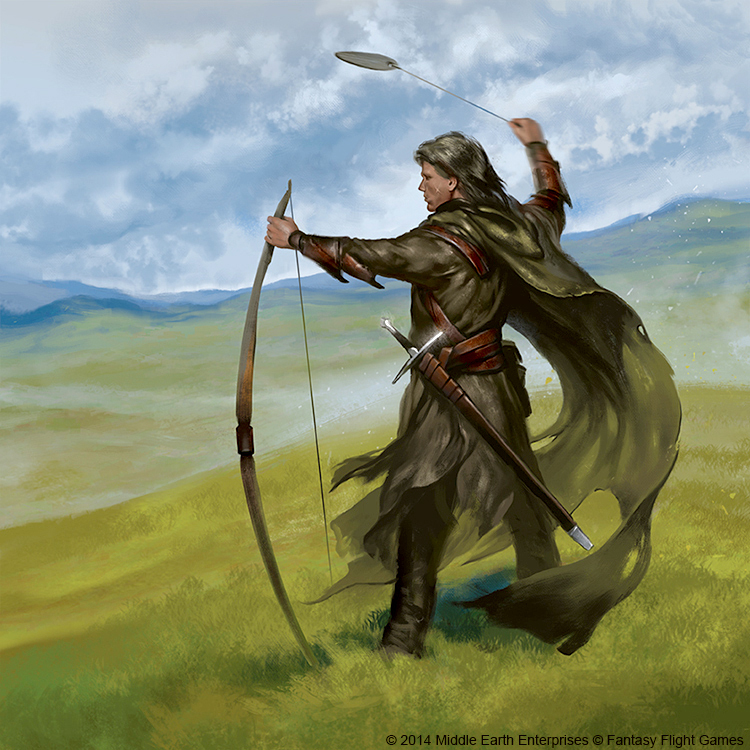 Surely not all Rangers ranged, but some of their families were kept safe in holdfasts and settlements spread throughout the regions we’ve just described, there to support the Rangers who hunt the enemies of Middle-earth. Perhaps we’ll even see a ‘Ranger Settlement’ location in The Lost Realm! Though this proved a lengthy article, several places were left untouched and, per usual, I feel I barely scratched the service with the ones that were included. I did not discuss Enedwaith or Eregion, as they were already featured as part of The Ring-maker cycle, in which we visited Tharbad and the Swanfleet (Nîn-in-Eilph) as well as Ost-in-Edhil. They are certainly worthy of a historical glance but that is for another article. The Shire and the regions to its west were also omitted. 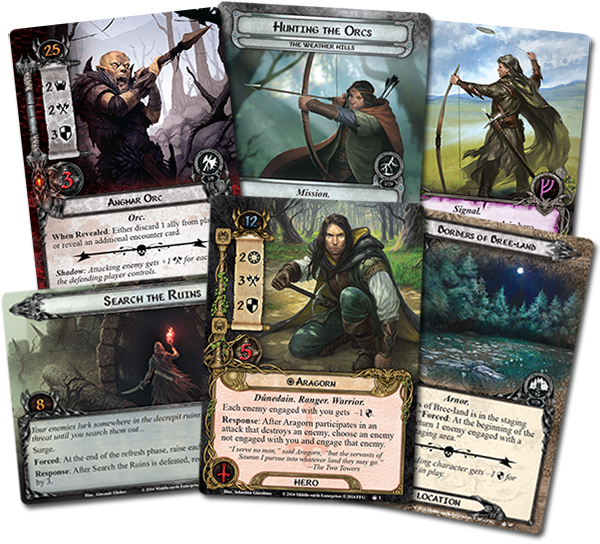 I do not believe that the Shire will feature heavily in this cycle as there is so much ground to be explored in the rest of the region and because it will surely feature heavily in the latter part of the LOTR saga expansions. Lindon and the Blue Mountains were also neglected for the same reason, but I hope I am wrong. A dwarvish expedition into the Ered Luin would be a fine and welcomed quest experience! Finally, I left out Evendim and Annúminas which may actually play a part in this cycle. If so, it’s more fodder for the Master of Lore. If nothing else there will be left room enough in the future for further exploration of Eriador and the Lost Realm of Arnor. Can you hear the Ranger Summons? Our adventures are coming soon! Of all these locations, I’m most excited to explore Forodwaith. 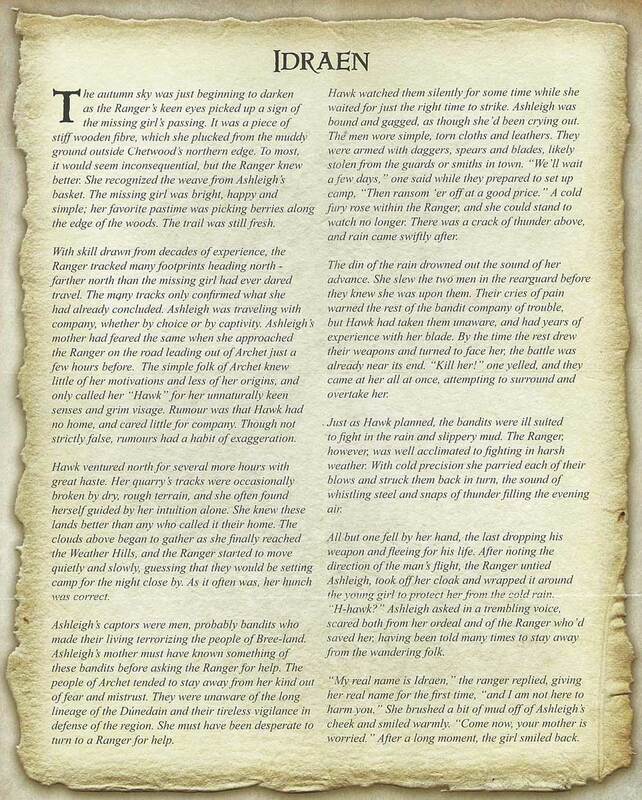 I think that the Lossoth are a fascinating, unique people and Appendix A actually offers a few details of their culture (compared to the Dunlendings) that could make for some interesting art direction. My excitement, which is already reaching a fevered pitch, will officially become delirium if we get a spoiler article announding “The Ice-bay of Forochel” as an adventure pack in this cycle! I agree, I’m fascinated by Forodwaith and the Lossoth, and we haven’t gotten much of a chance to play with snowy weather, aside from Redhorn Gate. I demand an objective Ice Sled attachment! What a lovely article, and excellent art and maps. Your blog is quickly becoming one of my favorites! I appreciate your attention to and respect of Tolkien’s little details. Side note: Your posts are so great, they’re making it almost unbearably hard to wait for The Lost Realm to arrive! Hooray and darn you all at the same time.